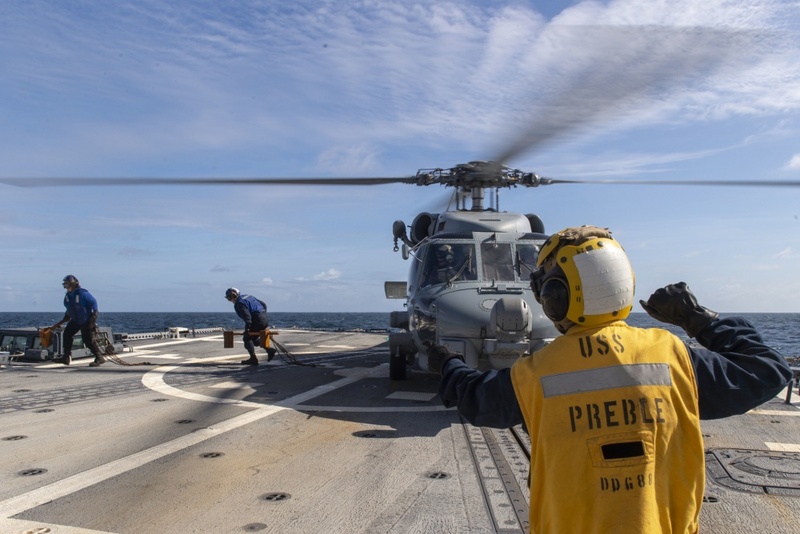 Monday, USS Spruance (DDG-111) and USS Preble (DDG-88) steamed within 12 nautical miles of Mischief Reef, which is an artificial island China has created to increase its territorial claims to the Spratly Islands chain, according to media reports. ABC News first reported the FONOP. Interactions with Chinese naval forces during the FONOP were described by a Defense official as routine and uneventful. This is the second FONOP the U.S. Navy conducted in the South China Sea this year. A month ago, USS McCampbell (DDG-85) steamed past the Paracel Islands. China routinely complains such FONOPS are illegal intrusions into its territorial waters. The U.S. Navy considers such operations in the South China Sea and around the globe as a way to combat what is deemed to be excessive maritime claims that are not in keeping with the spirit or intent of international law. The Spratly Islands chain includes more than 100 islands and land masses claimed by China, Malaysia, the Philippines, Taiwan and Vietnam, according to the CIA World Factbook. Mischief Reef is considered a low-tide elevation. Such features do not command a territorial sea under international maritime law. Meanwhile, Chinese and U.S. Navy forces are among the 46 nations taking part in the five-day AMAN-19 exercise hosted by Pakistan, according to a statement issued by China’s Ministry of Defense. The exercise focuses on cooperation among navies to conduct maritime security, counter-terrorism, and disaster relief operations, according to the Pakistan Navy.